The US/NATO designated AT-3A 'Sagger' (Russian industrial number 9K11, Russian name Malyutka Baby) entered service in 1963 with development being undertaken by the Kolomna KBM design bureau. According to Kolomna KBM, the innovate design solutions in combination with high producibility allowed them to create a system superior to all of its counterparts in combat effectiveness, operational simplicity and reliability which resulted in its wide proliferation all over the world. Over 200,000 systems have been built and the simplicity of its design and overall effectiveness has triggered its unlicensed reverse engineering in numerous countries: by China as the Red Arrow 73 and Improved Red Arrow 73C with Semi-Automatic Command-to-Line of Sight (SACLOS) guidance, Iran (Raad and its Improved Raad version with probe), North Korea and Taiwan (as the Kuen Wu-1 with a more rounded warhead section). 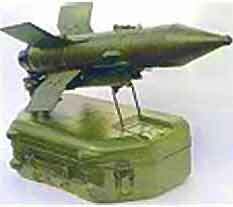 The AT-3 'Sagger' has been used in many conflicts especially in the Middle East, where the system engaged and destroyed a significant number of Israeli MBTs during the 1973 Arab-Israel war. (1) the9M14-2,9M14P-2 Malyutka-3 (AT-3d Sagger) is a missile version with a heavier (3.5 kg) and more powerful warhead that increases armour penetration to 800 mm of steel armour and average speed to 130 m/s. The mounting dimension of a new warhead are the same as of the basic version. In the travelling position, the stand off probe is placed inside the warhead. The probe is extended by the operator when he mounts the missile onto the rail guide. (3) the 9M14-2M, 9M14P-2M Malyutka-2M is a missile version with a tandem HEAT warhead which weighs 4 kg and will penetrate 720 mm of armour protected by Explosive Reactive Armour (ERA). 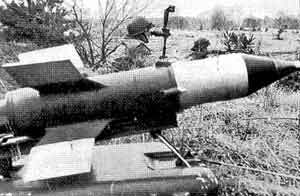 These upgraded versions of the AT-3 Sagger can be fired from all existing launchers without their modifications. The operator of the three man manpack system carries the 9S415 joystick control unit and the attached 9Shl6 periscope sight. 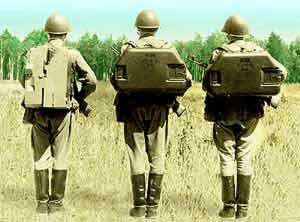 The second and third team members each carry a glass fibre suitcase that contains one 9M14 series missile. In addition, the 'suitcase' serves as a missile launcher base for the weapon and contains a small launcher rail that is attached to the top of the case. The launchers can be set up at distances of up to 15 m from the control unit with the link being maintained by a single cable. A single joystick controller can control up to four launchers of the 9K11 system in consecutive order. Deployment time for the teams equipment is about 5 minutes. The system has a 5 m dead zone since the missile is impossible to control for the first few seconds after launch. The gunner can control the 9M14 series by eye activities. 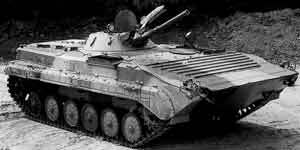 Original wheeled tank destroyer based on BRDM-1 4x4 chassis which has long been phased out of service. This system carried six missiles in the ready to fire position on the launcher rails and eight reloads in the hull. Replacement for the 9P110 system and mounted on the BRDM-2 (GAZ-41-06) 4x4 chassis. Equipped to fire 9M14M (AT-3b) missiles with six in ready to fire position on launcher rails and eight reloads inside of hull. Later version of 9P122 with enlarged optical sight system to fire improved SACLOS 9M14P (AT-3c) and 9M14P1 (AT-3c) missiles. The vehicle carries six ready to fire missiles with another ten carried internally. 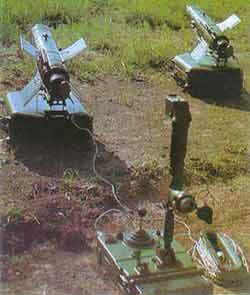 The missiles can be both the9M14Pand9M14P1 type. The main guidance mode is SACLOS with the MLOS mode as a back-up alternative. The 9K system is used as the secondary armament of the BMP-1 ICV and BMD-1 ACV. An external single rail launcher is fitted over the 73 mm main gun. The guidance optics are built into the gunner's IPN22 sight assembly. 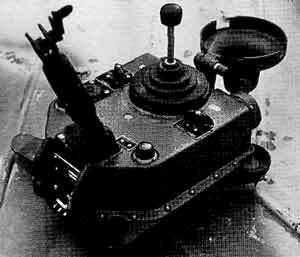 The joystick controller is kept under the gunner's turret seat until required. A total of three missiles are carried inside the vehicle for reloading with a fourth on the launch rail with reloading being accomplished manually through the turret hatch. The 9K11 system is also used on a number of other vehicles as secondary armament. The 9K11 system has been fitted to a number of helicopter types including the Mil Mi-8TVK 'Hip-F'. 4x4 BOV-1 (two three-rail launchers - Yugoslav (Serbia/Montenegro) Army).